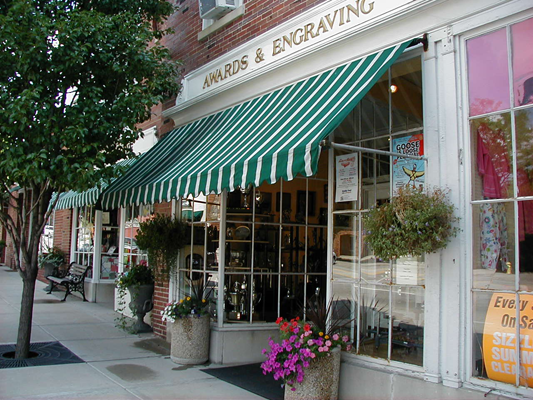 Located in Libertyville's historic downtown we have been suppling quality recognition products to our customers for over 70 years. Whether you are looking for large or small quantities, economical or high quality awards, we can provide them on time and within your budget. We work with companies and individuals designing employee award and company promotional programs. For customers who require an easy way of managing their employee awards program we can generate a secure website designed just for them. This allows their employees to select only those awards the company authorizes. If it's sports awards and trophies the customer needs we can custom build from stock components starting at an affordable $5.99. If you have questions please do not hesitate to contact us for advice or information on your needs.